Why is the American working class different? For generations, scholars and activists alike have wrestled with this question, with an eye to explaining why workers in the United States are not more like their radicalized European counterparts. Approaching the question from a different angle, Reds or Rackets? provides a fascinating examination of the American labor movement from the inside out, as it were, by analyzing the divergent sources of radicalism and conservatism within it. Kimeldorf focuses on the political contrast between East and West Coast longshoremen from World War I through the early years of the Cold War, when the difference between the two unions was greatest. He explores the politics of the West Coast union that developed into a hot bed of working class insurgency and contrasts it with the conservative and racket-ridden East Coast longshoreman's union. Two unions, based in the same industry—as different as night and day. The question posed by Kimeldorf is, why? 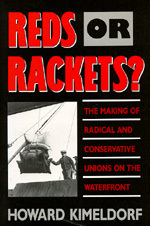 Why "reds" on one coast and racketeers on the other? To answer this question Kimeldorf provides a systematic comparison of the two unions, illuminating the political consequences of occupational recruitment, industry structure, mobilization strategies, and industrial conflict during this period. In doing so, Reds orRackets? sheds new light on the structural and historical bases of radical and conservative unionism. More than a comparative study of two unions, Reds or Rackets? is an exploration of the dynamics of trade unionism, sources of membership loyalty, and neglected aspects of working class consciousness. It is an incisive and valuable study that will appeal to historians, social scientists, and anyone interested in understanding the political trajectory of twentieth-century American labor. Howard Kimeldorf is Associate Professor of Sociology at the University of Michigan.